The British colonial modernity is the early modern period in Indian history, an intermediary phase between medieval and the developed modern. With the British came the European style of Academic realism, oil paintings that initiated a vast array of artwork during this period. The British also established art schools in India. The new British-style art schools attracted many upper class students who were interested in Western techniques and styles. One of the best known of the early painters to work in oil on canvas was the portrait painter Raja Ravi Varma (1848-1906). We can mark this phase as the pseudo-modern phase where rebellion took place within the confines of Academic realism. This coincided with the beginning of Indian freedom movement. The emergence of Bengal school of art can be placed in an important position. The Tagore family of Bengal were important in shaping India’s modern art. The Tagore’s stressed India’s spiritual heritage. Abanindranath Tagore taught at the Government Art School in Calcutta. Rabindranath Tagore, Nobel Prize winner for literature, founded a new educational centre, Santiniketan, where art was an important concern. Mughal painting is that particular style of South Asian painting which generally confines miniatures either as book illustrations or as single works to be kept in albums, which emerged from Persian miniature painting, with Indian Muslim, Hindu, Jain, and Buddhist influences, and developed largely in the court of the Mughal Empire of the 16th to 18th centuries. Mughal paintings later spread to other Indian courts, both Muslim and Hindu, and later Sikh. When Humayun returned to India, he brought two accomplished Persian artists Abd al-Samad and Mir Sayyid Ali with him. Humayun’s major known commission was a Khamsa of Nizami with 36 illuminated pages, in which the different styles of the various artists are mostly still apparent. Mughal painting developed and flourished during the reigns of Akbar, Jahangir and Shah Jahan. Akbar inherited and expanded his father’s library and atelier of court painters, and paid close personal attention to its output. He had studied painting in his youth under Abd as-Samad. Between 1560 and 1566 the Tutinama (“Tales of a Parrot”), now in the Cleveland Museum of Art was illustrated, showing “the stylistic components of the imperial Mughal style at a formative stage”. Between the years of 1570 to 1585 Akbar hired over a one hundred painters to practice Mughal style painting. Jahangir had an artistic inclination and during his reign Mughal painting developed further. Brushwork became finer and the colors lighter. Jahangir was also deeply influenced by European painting. During his reign he came into direct contact with the English Crown and was sent gifts of oil paintings, which included portraits of the King and Queen. Emperor Jahangir weighs Prince Khurram. During the reign of Shah Jahan (1628–58), Mughal paintings continued to develop, but court paintings became more rigid and formal. The illustrations from the “Padshanama” (chronicle of the King of the world), one of the finest Islamic manuscripts from the Royal Collection, at Windsor, were painted during the reign of Shah Jahan. Written in Persian on paper that is flecked with gold, has exquisitely rendered paintings. The Emperor Shah Jahan standing on a globe. 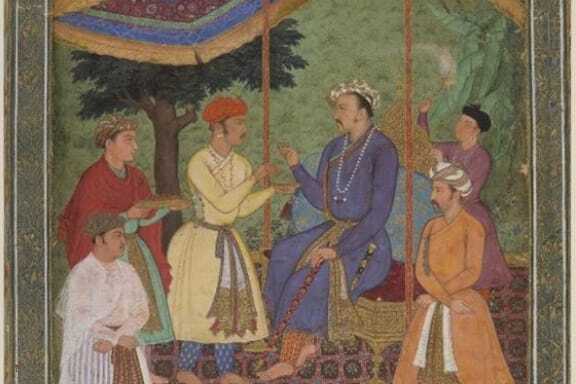 Aurangzeb (1658-1707) did not actively encourage Mughal paintings, but as this art form had gathered momentum and had a number of patrons, Mughal paintings continued to survive, but the decline had set in. A durbar scene with the newly crowned Emperor Aurangzeb. The last empire in southern India, has left spectacular remains of architecture, especially at Hampi, often heavily decorated with sculpture. These developed the Chola tradition. After the Mughal conquest, the Tamil temple tradition continued to develop, mainly in the expansion of existing temples. In South-Central India, during the late fifteenth century after the Middle kingdoms, the Bahmani sultanate disintegrated into the Deccan sultanates. They used vedic techniques of metal casting, stone carving, and painting, as well as a distinctive architectural style with the addition of citadels and tombs from Mughal architecture. Only after the Mughal conquest of Ahmadnagar in 1600 did the Persian influence patronized by the Turco-Mongol Mughals begin to affect Deccan art. The Char Minar mosque in Hyderabad. Portrait of Abu’l Hasan, the last Sultan of Golconda. British colonial rule had a great impact on Indian art, especially from the mid-19th century onwards. Western art more ubiquitous as the British Empire established schools of art in major cities. The oldest, the Government College of Fine Arts, Chennai, was established in 1850. In major cities with many Europeans, the Company style of small paintings became common, created by Indian artists working for European patrons of the East India Company. The style mainly used water color, to convey soft textures and tones, in a style combining influences from Western prints and Mughal painting. The fusion of Indian traditions with European style at this time is evident from Raja Ravi Varma’s oil paintings of sari-clad women in a graceful manner. Shakuntala by Raja Ravi Varma. Company Painting is a term for a hybrid Indo-European style of paintings made in India by Indian artists, many of whom worked for European patrons in the British East India Company. The style blended traditional elements from Rajput and Mughal painting. Company painting by Dip Chand. With the Swadeshi Movement gaining momentum by 1905, Indian artists attempted to resuscitate the cultural identities suppressed by the British, rejecting the Romanticized style of the Company paintings and the mannered work of Raja Ravi Varma and his followers. Thus was created what is known today as the Bengal School of Art, led by Abanindranath Tagore (1871—1951), who has been referred to as the father of Modern Indian art. Other artists of the Tagore family, such as Rabindranath Tagore (1861–1941) and Gaganendranath Tagore (1867–1938) as well as new artists of the early 20th century such as Amrita Sher-Gil (1913–1941). Many other artists like Jamini Roy and later S.H. Raza took inspiration from folk traditions. Asoka’s Queen by Abanindranath Tagore. How To Travel Light-10 Best Tips! 5 Quiet And Beautiful Places In Mumbai!